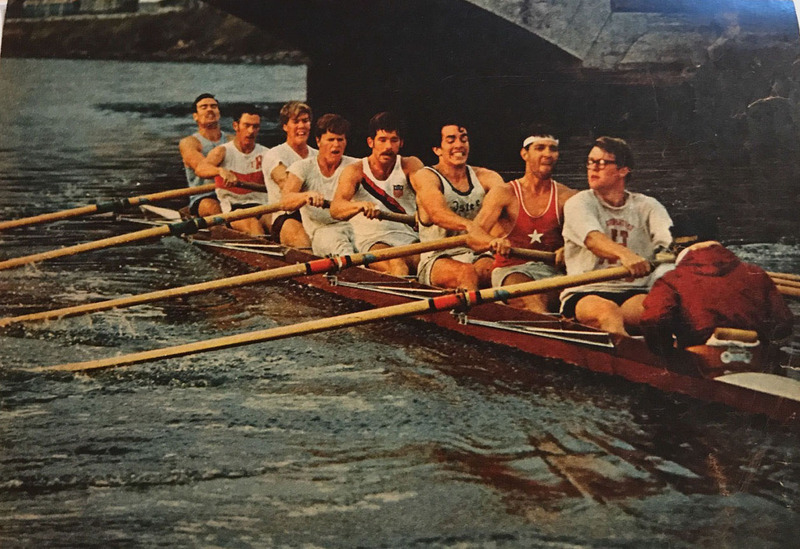 The U.S. 1968 Olympic eight, from the bow: David Higgins, Cleve Livingston, Steve Brooks, Franklin Hobbs, Scott Steketee, Andy Larkin, Curtis Canning, Arthur Evans (stoke), Paul Hoffman (cox). Photo provided by Andy Larkin. Andrew ‘Andy’ Larkin rowed for Harvard, raced at the European Championships and the Olympics, and then rowed in the slow lane, that is on the Connecticut River. In his brilliant autobiography My Life in Boats, Fast and Slow, which was published recently, he tells his story. Rowing historian Bill Miller has read Larkin’s book. Andrew Larkin’s memoir is about his family life, his young formative years, being “not much of a runner” on the Taft School cross-country squad, then enrolling at Harvard in 1964. He entered Newell Boathouse that September where he joined the freshman squad. In 1966, he secured a seat in the undefeated Harvard Varsity eight. He extended the Harvard Crew dynasty with another undefeated season and then placed 2nd at the 1967 European Championships. Finally, he rowed in the successful but tumultuous 1968 season. Later in life, after his medical practice and family life quieted down, he describes how he took to the Connecticut River for peaceful excursions in his Alden Ocean Shell, exploring quiet and scenic places in solitude. There have been a couple of books published about 1960s Olympic experiences, but they focus on the 1964 Vesper Eight at the Tokyo Olympics. Nothing has been published about the events leading up to the 1968 Olympic Eights Final. Larkin’s account is fascinating with all kinds of inside details that have been unknown to most rowing history enthusiasts. He describes entering Newell Boathouse in 1964 at a time when the young Harry Parker was just reaching his stride as a coaching wizard. Larkin dedicates a chapter describing Parker. He continues writing about his place as spare for the 1st freshman eight then sitting in the “combi” eight for the Yale-Harvard race. He points out in New London “One day Jake [Fiechter] suggested that we should pause at the finish of the stroke and let the boat run before beginning the next stroke. This was the start of what was to be called ‘Stop & Shop’ which characterized the 1968 Varsity [style]”. For the next three years Larkin describes his experiences in the 6-seat in the 1st varsity eight; undefeated seasons, international racing, 1968 U.S. Olympic Eight Trials, the controversy when six of the crew endorsed and promoted the “Olympic Project for Human Rights”, problems with altitude training, and finally their performance in Mexico City. What is especially interesting, Larkin includes fascinating documents and correspondence about their 1968 actions and racing results. After decades of life in medicine, Larkin takes to the water again, this time in an Alden Ocean Shell, nothing like the sleek Stämpfli eight that he left behind in 1968. Here he can soak in the beauty of the Connecticut River scenery in all seasons: the birds in spring, the flowers and trees in summer, leaves in the fall, and snow and ice on the banks in late fall. Finally, he challenges himself to row the Connecticut River from Northampton, Massachusetts, to Long Island Sound, camping along the way. Personal challenges overcome again. Perhaps you pulled an oar in the 1960s. Perhaps you rowed in later years. Maybe your interest is rowing history and events. Everyone will enjoy reading about the 1965-1968 Olympic quadrennial when the last college crew challenged the World. 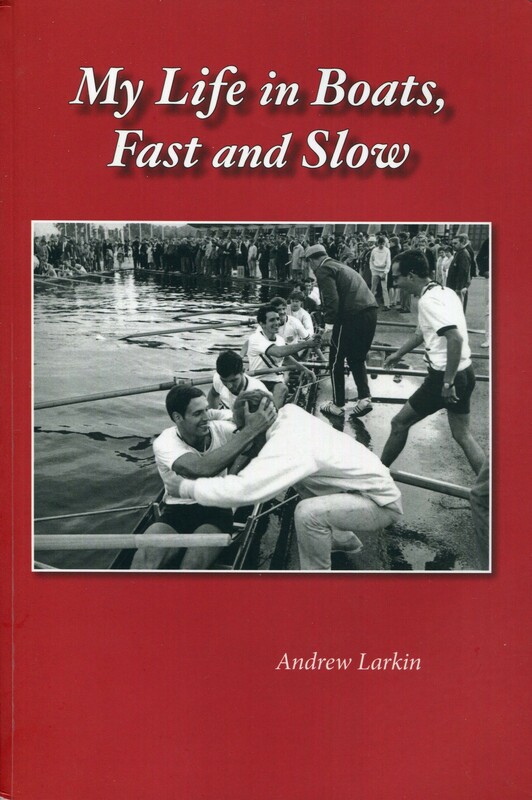 Andrew Larkin’s My Life in Boats, Fast and Slow is published by Off the Common Book, Amherst Massachusetts. Order your copy here.